Length: 18 hrs. 50 min. More than a Bible you listen to, the NIrV Audio Bible New Testament, Pure Voice is an experience that helps you enter into God's Word ... so God's Word can enter into you. 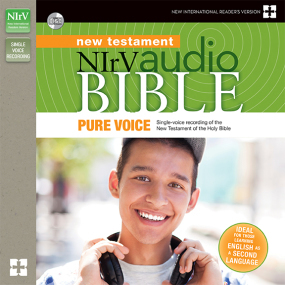 Featuring a single voice, this unabridged, digitally produced New International Reader's Version (NIrV) audio New Testament brings Scripture to life one vivid recording at a time.